We are happy to introduce you our experienced guide Oleg Shirokov. 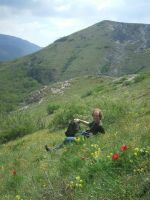 Having PhD and being experienced in tourism for almost 20 years he is an excellent guide and a good friend for our guests. Oleg Shirokov is an author and editor of numerous books and articles about Crimean history: "Simferopol. Streets story", "The book of Crimean records", "Endecken die Krim" etc. The sightseeing of Simferopol. Simferopol is a capital of the Crimea and all our guests first arrive here through the airport or railway station. In spite of officially Simferopol 225 years old but its history starts a few thousand years B.C. The Angar pass, Kutuzov`s Lake, hiking to one of the highest points of the Crimea - Eklizi-burun (1525 m / 5003 ft). The Demerji mountain - Valley of Phantoms - rock named "The head of Ekatherine II"
the sightseeing of Yalta - an international and world famous resort. Livadiya palace (residential of former Russian tsar, Yalta conference 1945). The Livadia Palace, built in 1910-1911, is now a museum. It was formerly a summer palace of the last Russian Imperial family. In 1945, it served as the meeting place of the Yalta Conference and residence of Franklin Delano Roosevelt during the Conference. Swallow Nest - symbol of the Crimea, unique palace located on the rock. Nikita botanical gardens. The unique collection of 50 000 plant from all parts of world. Sevastopol , the "hero town". Sevastopol together with Kronstadt and Gibraltar is one of the most famous naval citadels in Europe. One of the most notable events involving the city is the Siege of Sevastopol (1854-1855) carried out by the British, French, Sardinian and Turkish, troops during the Crimean War, which lasted for 11 months. Chersoness - Ancient Greek city with the only ancient theater at the territory of former USSR Hersones. Crimean War memorials (1854-1855), Balaclava trips, "Valley of Death" and "Charge of the Light Brigade" locations.